It is imperative for me to obtain an email address for Photoshop Family so I can email them to have my email address removed at once from their mailing list. I cannot remove it the suggested way because I have never posted anything on this site - so I can't pull up a post of mine to click "unfollow." There were over 4,000 (four thousand) emails from Photoshop today when I opened my inbox and I need rid of them ASAP. How can I facilitate this so I don't have to file an action against them for unsolicited mailings they keep sending me? I cannot provide help for the issue itself but for the time being I would recommend that you add »@getsatisfaction.com« to the addresses in your mail application’s spam filter. On my screen in the upper right, there is my username next to a round avatar image. when I hover over my name it brightens up. Click that. 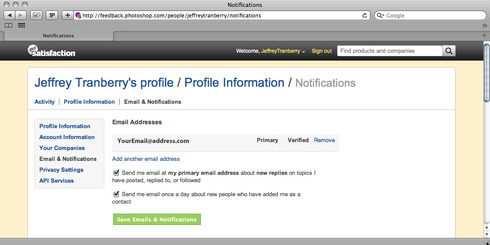 Select "Profile", then "EMail & Notifications". Adjust them how you want, then click Save. or, learn how filters work on your email platform and direct them to folder (or trash). I've submitted a support case for someone to help you if necessary.